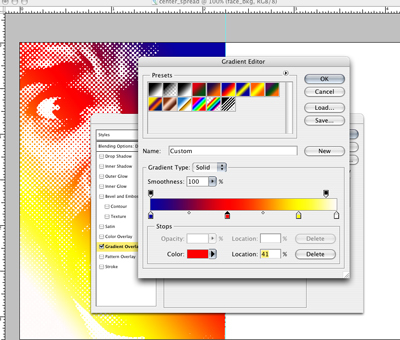 Using Photoshop gradient tool and brushes to create editorial graphics. 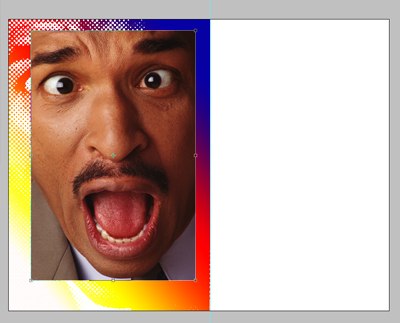 The graphic is a center spread page. Page one for headline with graphic and second page for the deck and to run the story. The head line is “Face Your fear” and we have a photo from stock photo. Which was small to fit the page. 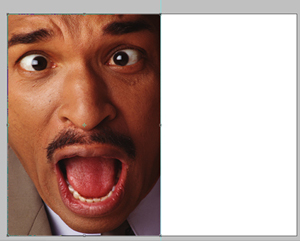 So I had to create the background which would be supportive to the stock photo I have. Paste the photo on the document. 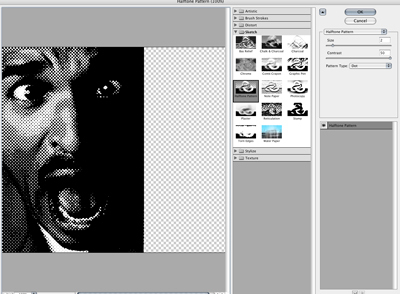 Go to layer palette click on the layer with holding down control key and select duplicate layer and name it Face_bkg. The bottom layer is your background for the graphic. Turn the top layer off. Make the image bigger (Command -t) and strech it while holding shift key. It keeps the image proportionate. The image will not be as sharp as the foreground image but I do not care because I am using gradation on the top it. Change the foreground color to black and background color to white. 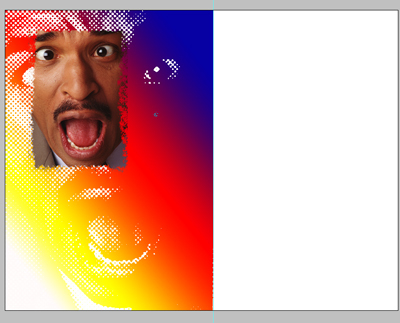 and go to Filter—–Sketch——Halftone Pattern. Move the size slider to 2 and contrast slider all the way to right 50.
select the top layer with the four color image and scale it down (command + t). Place the cursor on the handle and drag it down, holding shift key. Select magic wand from tools palette and click on the document anywhere but image. Inverse it (Common + Shift+I), and select mask (on the tools just below the color toggle there are two circle, first of which is a regular mode and the second reverse is a mask click on that). The image is covered with light red. 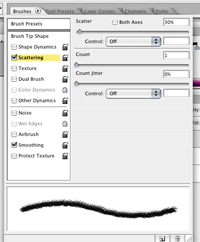 Select the eraser from tool and from top bar (window–options) choose brush (spatter 14). In brush preset check the Scattering and Texture. Click on the word scattering, it gives you an options. Now start erasing on the edge of the picture. (with eraser/brush mode/and newly created brush). Exit quick mask. Hit delete. The edge of the pic is now irregular, jagged ( now days withered look is popular). You have all the elements on the document, now play with both layers to make the right comp. I modified the back image ( flipped it, so that story has the light background) after discussing with the editor, artist. Below is the final snap of final printed art.